Vγ2Vδ2 T cells, a major human γδ T cell subset, recognize the phosphoantigen (E)-4-hydroxy-3-methyl-but-2-enyl pyrophosphate (HMBPP) produced by mycobacteria and some opportunistic pathogens, and they contribute to innate/adaptive/homeostatic and anticancer immunity. As initial efforts to explore Vγ2Vδ2 T cell-based therapeutics against HIV/AIDS-associated bacterial/protozoal infections and neoplasms, we investigated whether a well-defined HMBPP/IL-2 therapeutic regimen could overcome HIV-mediated immune suppression to massively expand polyfunctional Vγ2Vδ2 T cells, and whether such activation/expansion could impact AIDS pathogenesis in simian HIV (SHIV)-infected Chinese rhesus macaques. While HMBPP/IL-2 coadministration during acute or chronic phase of SHIV infection induced massive activation/expansion of Vγ2Vδ2 T cells, the consequences of such activation/expansions were different between these two treatment settings. HMBPP/IL-2 cotreatment during acute SHIV infection did not prevent the increases in peak and set-point viral loads or the accelerated disease progression seen with IL-2 treatment alone. In contrast, HMBPP/IL-2 cotreatment during chronic infection did not exacerbate disease, and more importantly it could confer immunological benefits. Surprisingly, although viral antigenic loads were not increased upon HMBPP/IL-2 cotreatment during chronic SHIV infection, HMBPP activation of Vγ2Vδ2 T cells boosted HIV Env-specific Ab titers. Such increases in Abs were sustained for >170 days and were immediately preceded by increased production of IFN-γ, TNF-α, IL-4, and IL-10 during peak expansion of Vγ2Vδ2 T cells displaying memory phenotypes, as well as the short-term increased effector function of Vγ2Vδ2 T cells and CD4+ and CD8+ αβ T cells producing antimicrobial cytokines. Thus, HMBPP/Vγ2Vδ2 T cell-based intervention may potentially be useful for combating neoplasms and HMBPP-producing opportunistic pathogens in chronically HIV-infected individuals. While current therapeutic and prevention strategies for HIV infection are mainly focused on antiretroviral treatment (ART)3 and vaccine induction of virus-specific B cell or CD4 and CD8 αβ T cell immune responses, ART requires life-long administration, and preventive immunotherapies have not yet achieved significant levels of protection. The latter is likely due to our incomplete grasp of correlates of protection as vividly illustrated in the recent failure of the STEP vaccine trial (1, 2). These findings rationalize a more thorough exploration of the role of other immune mechanisms with direct and/or indirect anti-HIV potential as novel strategies for HIV therapy. Among such alternative immune components, Vγ2Vδ2 (also called Vγ9Vδ2) T cells have received only minimal attention, although they represent the major circulating γδ T cell subset in primates, normally constituting 2–5% of peripheral blood T lymphocytes, and they are unique in their ability to massively expand in response to various bacterial and protozoal infections (3) and notably increase in patients with certain cancers (4, 5). Vγ2Vδ2 T cell expansion appears to be specifically mediated by low molecular mass foreign- and self-nonpeptidic phosphorylated metabolites of isoprenoid biosynthesis (e.g., (E)-4-hydroxy-3-methyl-but-2-enyl pyrophosphate (HMBPP), isopentenyl pyrophosphate (IPP), and its isomer dimethylallyl pyrophosphate) (6, 7, 8), commonly referred to as phosphoantigens. HMBPP is produced in the 2-C-methyl-d-erythritol-4-phosphate pathway of isoprenoid biosynthesis of most eubacteria, apicomplexan protozoa, plant chloroplasts, and algae, but not in vertebrates and thus not in the human host (9). Although IPP is also produced in humans, its bioactivity is ∼104 lower than that of HMBPP (6, 10, 11). Thus, much higher levels of endogenous IPP (e.g., those produced during cellular stress or transformation) (4, 12, 13) are likely needed to trigger IPP-specific Vγ2Vδ2 T cell responses. We hypothesize that lentivirus-infected cells are metabolically stressed and may accumulate substantial levels of endogenous IPP or other molecules that can activate Vγ2Vδ2 T cells, which in turn may regulate the infected cells by suppressing their biological function. In vitro, Vγ2Vδ2 T cells from healthy donors proliferate in response to HIV-infected cells (14), exert a powerful cytotoxic activity against HIV-infected targets (15), suppress HIV/SIV replication (15, 16), and produce the HIV/SIV inhibitory β-chemokines (16, 17) and other antiviral factors (14, 16). Additionally, since activated Vγ2Vδ2 T cells influence dendritic cell maturation (18) and the adaptive αβ T cell (19, 20) and B cell (21, 22) responses, they may also have indirect antiviral activities. Furthermore, Vγ2Vδ2 T cell responses may be important in combating opportunistic infections (23, 24, 25, 26, 27) and neoplasms (4) that arise in advanced HIV infection. However, the direct cross-regulation of HIV and massively expanded Vγ2Vδ2 T cells has not been characterized in vivo. Previous investigations report a depletion of Vγ2Vδ2 T cells during HIV infection (28, 29) and ex vivo experiments using Vγ2Vδ2 T cells from HIV+ patients have indicated these cells are impaired in their proliferative (30) and cytokine expression abilities (31). Thus, the potent Vγ2Vδ2 T cell antiviral activities observed in healthy donors appear markedly diminished in HIV-infected patients and in nonhuman primate models of HIV (32), likely as a result of diminished Vγ2Vδ2 T cell numbers and function (28, 31, 33, 34). These changes may contribute to inadequate antiviral immune responses as well as the coincident development of opportunistic infections and neoplasms (35), and they are only partially reversed by highly active antiretroviral therapy (HAART) (36). This set of findings provides a rationale for attempting to modulate Vγ2Vδ2 T cells in vivo to delineate their exact role in the context of lentivirus infection and to explore them as novel potential immunotherapies. We previously reported that treatment of healthy macaques with the Vγ2Vδ2 T cell Ag HMBPP along with IL-2 costimulation leads to massive expansion of circulating Vγ2Vδ2 T cells as well as marked accumulation of these cells at mucosal sites (37). These activated Vγ2Vδ2 T cells were able to potently produce cytotoxic and antimicrobial factors and also influenced αβ T cell responses (37). Additionally, we have also found that HMBPP-specific Vγ2Vδ2 T effector cells confer homeostatic protection against mucosal lesions (38). Thus, treating lentivirus-infected macaques with HMBPP plus IL-2 would provide a useful model to evaluate the potential immunotherapeutic benefits of activated Vγ2Vδ2 T cells. To address this, we utilized a HMBPP/IL-2 cotreatment regimen in the pathogenic simian HIV (SHIV) model of AIDS in Chinese-origin rhesus macaques. We found that HMBPP/IL-2 cotreatment during early and chronic phases of infection led to massive expansion of Vγ2Vδ2 T cells as well as transient increases in CD4+ and CD8+ αβ T cells. HMBPP/IL-2 cotreatment during chronic SHIV infection led to (1) increases in effector Vγ2 and αβ T cells displaying proinflammatory memory phenotypes and producing antimicrobial cytokines; (2) increases in systemic IFN-γ, TNF-α, IL-4, and IL-10; (3) sustained increases in virus-specific Abs; and (4) no exacerbation of disease with regard to rectal mucosal CD4 T cell depletion, plasma viral loads, and survival. In contrast, HMBPP/IL-2 cotreatment during acute SHIV infection, perhaps due to effects of the IL-2 treatment, increased peak and set-point plasma viral loads, and prevented seroconversion to viral gp120 or gag, with some animals becoming moribund earlier than sham-treated controls. These findings demonstrate that functional Vγ2Vδ2 T cell responses can be elicited during early and chronic phases of SHIV infection with exogenous IL-2 plus HMBPP cotreatment and that at least during chronic infection, these mechanisms may be explored further for potential immunotherapeutic benefits against AIDS-associated malignancies or coinfections with HMBPP-producing microbes, even in those individuals with extremely low CD4 T cell counts. Seventeen Chinese-origin rhesus macaques (Macaca mulatta), 6.6 ± 0.5 years in age and 4 to 7 kg in weight that were free of simian retrovirus, simian T lymphotrophic virus type 1, and SIV infection, were used in this study. All animals were maintained and used in accordance with guidelines of the Institutional Animal Care and Use Committee. Animals were anesthetized with 10 mg/kg ketamine HCl (Fort Dodge Animal Health) i.m. for all blood sampling, infections, and treatments. Animals were inoculated i.v. with 1000 50% monkey infectious doses SHIV89.6P (original stock described and provided by K. Reimann (39)) in 1 ml of 10% FBS-RPMI 1640. EDTA anticoagulated blood was collected at various time points before and after infection. Day 0 blood was drawn immediately before infection. HMBPP was synthesized and administered as described previously (37). Human recombinant IL-2 (Proleukin; Chiron) was administered as described previously (37) with the exception of the dose, which was given based on the weight of the animals since the macaques used here were larger than those used in previous studies (37). Briefly, each time that treatment was administered, macaques received a 1-ml i.m. injection of 50 mg/kg HMBPP and 0.5-ml s.c. injections of 0.25 million IU/kg IL-2 once daily for 5 consecutive days beginning on the day of HMBPP treatment. As controls, animals received 0.25 million IU/kg IL-2 alone or sham injections of saline (1 ml i.m.) and sterile double-distilled H2O (0.5 ml s.c. for 5 consecutive days). Before rectal biopsy sampling, animals were subjected to 24-h fasting and were anesthesized with 1–2 mg/kg xylazine (Ben Venue Laboratories) and 10 mg/kg ketamine HCl i.m. Animals were restrained in ventral recumbency with the pelvic area supported and elevated ∼10–13 cm above the remainder of body. With the aid of a speculum, 2 × 3-mm biopsy forceps were used to collect 8–10 superficial tissue biopsies at each time point. PBL were isolated from freshly collected EDTA blood by Ficoll-Paque Plus (Amersham) density gradient centrifugation before analysis. Lymphocyte isolation from freshly collected rectal mucosal biopsies were done according to Veazey et al. (40) with minor changes. Briefly, biopsies were collected in RPMI 1640 containing 5% FBS (Invitrogen), washed, incubated for 30 min (37°C, 300 rpm) in 5%-FBS-HBSS plus 5 mM EDTA, and, upon washing, incubated in 5% FBS-RPMI 1640 plus 90 U/ml collagenase (Sigma-Aldrich) for 1 h (37°C, 300 rpm). Samples were repeatedly aspirated with a 16-gauge needle to disrupt tissue and filtered through 70-μm cell strainers before layering on Percoll gradients (35 and 60%) and centrifuging at 1700 rpm for 20 min, after which the cells from the interface between the 35 and 60% Percoll layers were collected and washed with 10% FBS-RPMI 1640 before analysis. For cell-surface staining, PBL and rectal mucosa cells were stained with up to 5 Abs (conjugated to FITC, PE, allophycocyanin, Pacific Blue, and PE-Cy7) for at least 15 min. After staining, cells were fixed with 2% formaldehyde-PBS (Protocol Formalin; Fisher Diagnostics) before analysis on a CyAn ADP flow cytometer (Dako). Lymphocytes were gated based on forward and side scatters, and pulse width and at least 40,000 gated events were generally analyzed using Summit data acquisition and analysis software (Dako). Absolute cell numbers were calculated based on flow cytometry data and complete blood counts that were performed on a hematology system (Advia 120; Siemens). The following mouse mAbs were used: Vγ9 (7A5), Vδ2 (15D), Vδ1 (TS8.2), Panγδ (5A6.E9) (Pierce); CD3 (SP34-2), CD4 (L200), CD8 (RPA-T8), CD27 (M-T271), CD28 (CD28.2), CD45RA (5H9), CD49d (9F10), CD95 (DX2), CCR5 (3A9), CXCR4 (12G5), IFN-γ (4S.B3), TNF-α (MAB11) (BD Pharmingen); CD4 (OKT4), CD27 (O323) (eBioscience), and CCR7 (150503) (R&D Systems). PE-conjugated goat F(ab′)2 anti-mouse IgG (Fcγ) (Beckman Coulter) was used as a secondary Ab for indirect staining of Vδ2. IgG isotype-matched controls were also used. Staining panels were as follows: CD3/CD4/CD8/Vγ2/Vδ2; CD3/panγδ/Vδ1/CD4/CCR5; CD3/CD4/CD28/CD95/CXCR4; CD3/CD8/Vγ2/CD28/CD95; CD3/CD8/Vγ2/CD45RA/CCR7; CD3/CD4/Vγ2/CD27/CD45RA; and CD3/CD8/Vγ2/CCR5/CXCR4. For intracellular cytokine staining, 0.5 × 106 PBL plus costimulatory mAbs CD28 (1 μg/ml) and CD49d (1 μg/ml) were incubated with HMBPP (40 ng/ml), SIVmac239 Gag peptide pool (1 μg/ml), or media alone in 200 μl of final volume for 1 h at 37°C, 5% CO2 followed by an additional 5 h of incubation in the presence of brefeldin A (GolgiPlug; BD Pharmingen). Peptides were obtained from the National Institutes of Health AIDS Research and Reference Reagent Program. After staining cell-surface markers (CD3, CD4, and Vγ2 or CD8) for at least 15 min, cells were permeabilized for 45 min (Cytofix/Cytoperm; BD Biosciences) and stained another 45 min for intracellular cytokines (TNF-α and IFN-γ) before resuspending in 2% formaldehyde-PBS. Plasma viral loads were determined by quantitative RT-PCR using SIVgag primers described previously (41). Briefly, plasma virus was pelleted from 0.6 to 1.0 ml of EDTA anticoagulated plasma and extracted with guanidium isothiocyanate as described (42). The purified RNA aliquots were then reverse transcribed with the Avian RT First Strand Synthesis kit (Sigma-Aldrich) and the SIVgagRTR primer (CAA TTT TAC CCA GGC ATT TAA TGT T) along with a 10-fold dilution series of SIVgag RNA standards containing 108 to 0.01 copies and three reference viral controls. After inactivation of the reverse transcriptase at 95°C, PCR amplification was performed using the SYBR GreenER amplification kit (Sigma- Aldrich) in a Bio-Rad iCycler using 40 cycles of 95°C for 15 s and 60°C for 1 min. The validity of the signals was then verified by a final melt-curve analysis. The numbers of copies were calculated relative to the standard SIV RNA dilution curve and the final dilution factor of the prepared plasma RNA. Plasma samples previously frozen at −80°C were thawed, treated at 56°C for 30 min, and analyzed for Gag and Env-specific IgGs by an ELISA. The Ags (SIVmac251 (BK28) Pr55 Gag and HIV-1Bal gp120) and positive control sera (SIVmac251 antiserum and HIV gp160 antiserum) (43, 44, 45) were obtained through the National Institutes of Health AIDS Research and Reference Reagent Program. The ELISA reagents were purchased from KPL. Briefly, high-binding capacity 96-well ELISA plates (Costar) were coated with 100 μl of Ag (1 μg/ml) in coating buffer and incubated overnight at 4°C. The plates were washed four times in wash buffer by using a semiautomatic microplate washer (Wellwash Mk2; Thermo Fisher Scientific) and treated with blocking solution for 1 h at 37°C. After washing four times, the plates were incubated with dilutions (1/50) of each plasma sample for 1 h at 37°C. The wash cycle was repeated and a dilution (1/3000) of peroxidase-conjugated anti-monkey IgG (Sigma-Aldrich) was incubated for 1 h at 37°C. A colorimetric reaction was obtained by addition of the ABTS one-component microwell peroxidase substrate for 8–10 min. OD405 values were determined with an ELISA plate reader (Bio-Rad model 550). All tested plasma and control sera were replicated three times in independent ELISA tests. The cutoff OD value was defined as the mean OD plus 3 SDs obtained from the negative plasma samples collected from monkeys before infection and treatment. Plasma samples previously frozen at −80°C were thawed, diluted, and analyzed for the following cytokines: IFN-γ, TNF-α, IL-2, IL-4, and IL-10 using the Monkey Cytokine Five-Plex kit (Invitrogen) as per the manufacturer’s instructions. The samples were analyzed by a Bio-Plex Luminex 100 instrument (Bio-Rad). Cytokine concentrations were calculated relative to the standard dilution curve using Bio-Plex Manager 5.0 software (Bio-Rad). Data are expressed as averages ± SEM. Statistical analysis was done using Student’s t test, as previously described (23). We have recently demonstrated that HMBPP/IL-2 cotreatment can stimulate a prolonged massive expansion of Vγ2Vδ2 T effector cells that produce antimicrobial cytokines (37) as well as induce homeostatic protection against plague lesions (38). To address the initial practical question as to whether Vγ2Vδ2 T cells can overcome HIV immune suppression and undergo major expansion upon HMBPP/IL-2 cotreatment, macaques were sequentially cotreated with HMBPP plus low-dose IL-2 beginning 3 days before SHIV infection (acute-stage treatment) and again at day 17 postinfection (postacute-stage treatment) (n = 4). Control animals received IL-2 alone (n = 3) or sham injections (n = 10) at the same time points before and after SHIV infection. Similar to data obtained in uninfected monkeys that were given HMBPP plus IL-2 (37), peripheral Vγ2Vδ2 T cells massively expanded after each HMBPP/IL-2 cotreatment during acute and postacute phases of SHIV infection, with peak levels seen at 4–5 days after the beginning of each treatment whereby sham or IL-2 treatment alone did not promote Vγ2Vδ2 T cell expansion (Fig. 1⇓, a and b). Circulating Vγ2Vδ2 T cells expanded to 81.7 ± 2.7 and 65.8 ± 6.5% of total CD3+ T cells after cotreatment during acute and postacute infection, respectively, and remained 3.9 ± 0.9-fold above baseline in relative percentage of CD3+ T cells at 102 days postinfection and 4.6 ± 0.8-fold above baseline in absolute number at 70 days postinfection. Thus, Vγ2Vδ2 T cells underwent a prolonged massive expansion after sequential HMBPP/IL-2 cotreatment during early SHIV infection. HMBPP/IL-2 cotreatment initiated during early SHIV infection induces expansion of circulating Vγ2Vδ2 and αβ T cells but enhances viral infection. The relative percentage of CD3+ T cells that express Vγ2Vδ2 in the circulation (a) or CD4 in the rectal mucosa (e) and absolute numbers of circulating T cells per microliter of blood that express Vγ2Vδ2 (b), CD8+Vγ2− (c), or CD4+ (d) are shown over time for groups treated with HMBPP plus IL-2, IL-2 alone, or sham as averages ± SEM. Arrows indicate the time when treatment was given. Animals with severe prolonged CD4 T cell depletion (<3% of total CD3+ cells) in the rectal mucosa were stratified from the rest of their groups (e). Average SIVgag RNA copies per milliliter of plasma are shown over time for groups treated with HMBPP plus IL-2, IL-2 alone, or sham during both early and chronic infection (f). By Student’s t test, viral copy numbers are statistically higher (p < 0.05) at the following time points for HMBPP plus IL-2- (days 12, 22, 54, and 102) and IL-2 only- (days 12, 54, 102, and 123) treated groups compared with the sham-treated group (f). The viral levels substantially dropped at the last two data time points for the cotreated group since the two animals in this group with high viral loads did not survive at these time points. The next question we sought to address was whether prolonged massive expansion of Vγ2Vδ2 T cells after HMBPP/IL-2 treatment could impact early AIDS virus infection. This unanswered question is interesting, as highly pure HMBPP only stimulates Vγ2Vδ2 T cells without direct activation of CD4 T cells. We therefore examined if Vγ2Vδ2 T cell expansion could affect peak and set-point viral loads and CD4 T cell levels in early SHIV infection. Because we previously found that HMBPP/IL-2 cotreatment in healthy macaques indirectly increased CD8+ and CD4+ αβ T cell levels in the circulation (37) and the intestinal mucosa (data not shown), we examined CD8+ and CD4+ T cell levels after sequential HMBPP/IL-2 cotreatment during acute and postacute stages of SHIV infection. Absolute numbers of circulating CD8+Vγ2− αβ T cells transiently increased 1.7 ± 0.1- and 3.8 ± 0.6-fold 5–7 days after the acute and postacute-stage cotreatments, respectively, which occurred earlier than with IL-2 treatment alone (Fig. 1⇑c). Also, absolute numbers of circulating CD4 T cells transiently increased 3 ± 0.9-fold 5–7 days after the acute-stage cotreatment (Fig. 1⇑d). However, these increases were not mirrored in the rectal mucosa, as no increases in CD4+ (Fig. 1⇑e) or CD8+Vγ2− (data not shown) αβ T cells were detected upon HMBPP/IL-2 cotreatment during acute and postacute infection. In contrast, 2 of 4 and 3 of 3 animals that received HMBPP plus IL-2 or IL-2 alone, respectively, during early infection had a profound sustained decrease in rectal mucosal CD4 T cell levels beginning at day 26 postinfection, while only 4 of 10 sham-treated animals had similar decreases in intestinal CD4 T cell levels (Fig. 1⇑e). Furthermore, animals that received HMBPP plus IL-2 or IL-2 alone during acute infection had peak plasma virus levels that were on average 5.4- or 22.7-fold higher, respectively, than sham-treated controls (Fig. 1⇑f). Additionally, upon reaching viral set point, plasma virus levels remained significantly higher in those animals that received HMBPP plus IL-2 (p = 0.0126 at day 12, p = 0.0309 at day 22, p = 0.0522 at day 34, p = 0.048 at day 54, p = 0.0081 at day 102, and p = 0.0556 at day 123) or IL-2 alone (p = 0.0409 at day 12, p = 0.2283 at day 22, 0.1321 at day 34, p < 0.0001 at day 54, p < 0.0001 at day 102, and p = 0.0248 at day 123) during the acute and postacute stages of infection compared with those animals that received sham treatments (Fig. 1⇑f). Therefore, while HMBPP/IL-2 cotreatments during the early stages of SHIV infection led to massive prolonged Vγ2Vδ2 T cell expansion and transient increases in circulating CD8+ and CD4+ αβ T cells, these increases appear to be ineffective in stemming the enhancement of SHIV infection seen with IL-2 treatment alone. Since one of our goals was to determine the potential utility of HMBPP/IL-2 regimen for treatment of AIDS-associated neoplasms and infections with HMBPP-producing microbes, we sought to investigate whether HMBPP/IL-2 cotreatment given during chronic SHIV infection would still expand Vγ2Vδ2 T effector cells but lead to a different immune consequence from what was seen in the acute SHIV infection. This question appeared to be critical and highly relevant, given that we previously demonstrated that chronic high SIV viremia led to dysfunctional Vγ2Vδ2 T cell responses during later stages of infection (32), and that antiviral immune responses that emerge after viral set point might antagonize activation-enhanced viral pathogenicity. Thus, we cotreated chronically SHIV-infected macaques previously naive to treatment (n = 3) or those that had previously received treatment during early infection (n = 4) with HMBPP plus low-dose IL-2 at 118 or 102 days postinfection, respectively. Animals that received IL-2 alone during early infection again received IL-2 alone at 102 days postinfection (n = 3). Another group previously naive to treatment received IL-2 alone at 118 days postinfection (n = 3) or were given sham injections (n = 4) during chronic SHIV infection. In the two groups of cotreated animals, we found that circulating Vγ2Vδ2 T cells markedly expanded to 70.3 ± 4.0 and 41.9 ± 12.2% of total CD3+ T cells (Figs. 2⇓a and 1a, respectively) 5–7 days after HMBPP treatment. In previously untreated animals, Vγ2Vδ2 T cells remained 4 ± 0.5- and 4.2 ± 0.1-fold above pretreatment baseline in relative percentage and absolute number, respectively, 20 days postchronic-stage cotreatment (Fig. 2⇓, a and b). In the previously treated group, Vγ2Vδ2 T cell levels remained 2.4 ± 0.3- and 2.6 ± 0.2-fold above pretreatment baseline in relative percentage and absolute number, respectively, 21 days postchronic-stage cotreatment (Fig. 1⇑b). Furthermore, we were able to detect an increased percentage of Vγ2Vδ2 T cells in the rectal mucosa of one cotreated animal in each group from 1.7 ± 0.4% of CD3+ T cells pretreatment to 5.4 ± 0.6% 1–3 wk posttreatment, while Vγ2Vδ2 T cells in IL-2 alone or sham-treated animals were not markedly increased in the rectal mucosa at these time points (data not shown). Thus, the expansion capacity of Vγ2Vδ2 T cells after HMBPP/IL-2 treatment appeared preserved in all animals that received HMBPP/IL-2 cotreatment during the chronic stage of SHIV infection, although the duration of the expansion was considerably shorter than that seen during the early stage infection (Fig. 1⇑, a and b) or that seen in healthy animals (37). HMBPP/IL-2 cotreatment during chronic SHIV infection induces expansion of circulating Vγ2Vδ2, CD4, and CD8 αβ T cells. The relative percentage of CD3+ T cells that are Vγ2Vδ2 in the circulation (a) or Vγ2−CD8+ (e) or CD4+ (f) in the rectal mucosa and absolute numbers of circulating Vγ2Vδ2 (b), Vγ2−CD8+ (c), and CD4+ (d) T cells per microliter of blood are shown over time for groups treated with HMBPP plus IL-2, IL-2 alone, or sham as averages ± SEM. Arrows indicate the time when treatment was given. These animals were naive to any previous treatments. One control animal that was sham treated throughout the course of infection had a considerable long-lasting increase in Vγ2 T cells beginning 121 days postinfection and is shown as an outlier (a and b). Another sham-treated animal did not have a decrease in CD4+ PBL upon infection and is shown as an outlier (d). Additionally, in previously untreated animals, absolute numbers of circulating CD8+Vγ2− and CD4+ αβ T cells transiently increased 3.1 ± 1.0- and 2.9 ± 0.8-fold, respectively, 5–9 days after chronic-stage HMBPP/IL-2 cotreatment (Fig. 2⇑, c and d). In the group that had previously received HMBPP/IL-2 cotreatment during early infection, absolute numbers of circulating CD8+Vγ2− and CD4+ αβ T cells transiently increased 1.8 ± 0.2- and 12.6 ± 4.7-fold, respectively, 7 days after the chronic-stage cotreatment (Fig. 1⇑, c and d). In the rectal mucosa, neither CD8+Vγ2− (Fig. 2⇑e) or CD4+ (Figs. 1⇑e and 2⇑f) αβ T cells increased upon HMBPP/IL-2 cotreatment during chronic infection. Thus, CD4 T cell levels in the intestinal mucosa remained stable and viral pathogenicity was not enhanced (Fig. 3⇓) in the presence of massive Vγ2Vδ2 T cell expansion upon chronic-stage cotreatment. HMBPP/IL-2 cotreatment only during chronic infection does not affect viral load or survival. Average SIVgag RNA copies per milliliter of plasma are shown over time for groups treated with HMBPP plus IL-2, IL-2 alone, or sham only during chronic infection (a). Arrow indicates the time when treatment was given. Percentages of surviving animals over time are shown for groups treated with HMBPP plus IL-2, IL-2 alone, or sham only during chronic infection at day 118 postinfection or during both acute and chronic infection at days −3, 17, and 102 postinfection (indicated with asterisks) (b). We then sought to determine how the massive Vγ2Vδ2 T cell expansions during chronic infection affected viral dynamics based on levels detected in the plasma. In all animals that only received cotreatment during chronic infection, plasma viral levels did not increase and even slightly decreased on days 2–6 after peak Vγ2Vδ2 T cell expansion (Fig. 3⇑a). In contrast, in those animals that had previously received treatments during early infection, further treatment with IL-2 or HMBPP plus IL-2 during chronic infection transiently increased plasma virus levels 4.5 ± 1.2- and 7.4 ± 5.9-fold, respectively (Fig. 1⇑f). Additionally, we followed the animals up to 42 wk postinfection to document whether the various treatments during chronic and early infection had any impact on disease progression. All of the animals that were treated only during chronic infection at week 17 postinfection with HMBPP plus IL-2 (n = 3), IL-2 alone (n = 3), or sham injections (n = 4) were alive at week 37 with plasma viral loads of 1.1 ± 0.9 × 105, 2.0 ± 1.4 × 105, and 1.5 ± 1.2 × 105 SIV RNA molecules/ml, respectively (Fig. 3⇑b). In contrast, three of the three animals sequentially treated with only IL-2 beginning at acute infection had to be euthanized at weeks 18, 25, and 36 due to AIDS with plasma viral loads of 8.9 × 105, 3.9 × 105, and 1.8 × 106 SIV RNA molecules/ml, respectively (Fig. 3⇑b). Also, two of the four animals that were sequentially cotreated with HMBPP plus IL-2 beginning at acute infection had to be euthanized at weeks 19 and 29 due to AIDS with plasma viral loads of 1.2 × 106 and 9.7 × 104 SIV RNA molecules/ml, respectively (Fig. 3⇑b). The other two animals in this group were alive at week 42 with a viral load of 4.7 ± 1.1 × 102 SIV RNA molecules/ml (Fig. 3⇑b). Thus, inducing massive Vγ2Vδ2 T cell expansion via HMBPP/IL-2 cotreatment during chronic infection does not appear to exacerbate the disease. The absence of Vγ2Vδ2 T cell-based enhancement of SHIV disease after HMBPP/IL-2 treatment of chronically infected macaques prompted us to investigate a series of potential immunological benefits. Since Vγ2Vδ2 T cells were able to massively expand in all animals cotreated with HMBPP plus IL-2 during chronic SHIV infection, we sought to examine the effector potential of these activated cells by longitudinally comparing circulating Vγ2Vδ2 T cell phenotypes in animals before infection and after treatment during chronic-stage infection based on their expression of the (1) surrogate memory markers CD45RA and CD95, (2) costimulatory molecules CD27 and CD28, and (3) chemokine homing receptors CCR5, CCR7, and CXCR4. Collectively, we found that Vγ2Vδ2 T cells that expanded upon HMBPP/IL-2 cotreatment during chronic infection display predominantly a proinflammatory memory phenotype characterized as follows: CCR5+CXCR4−CCR7−CD45RA−CD95+CD27+CD28+ (Fig. 4⇓a–d), with a large proportion of these cells having the CD45RA−CD27− effector memory phenotype (Fig. 4⇓c). Thus, the Vγ2Vδ2 T cells that expanded during chronic SHIV infection are phenotypically indistinguishable from those that expanded in healthy animals treated with HMBPP plus IL-2 and may retain their effector function(s) (37). HMBPP/IL-2 cotreatment during chronic SHIV infection leads to increases in Vγ2 and αβ T cells with proinflammatory memory phenotypes. Absolute numbers of circulating Vγ2+ T cells expressing CCR5 and/or CXCR4 (a), CD45RA and/or CCR7 (b), CD45RA and/or CD27 (c), or CD28 and/or CD95 (d) and Vγ2−CD8+ T cells expressing CD28 and/or CD95 (e) and CD4+ T cells expressing CCR5 and/or CXCR4 (f), CD45RA and/or CD27 (g), or CD28 and/or CD95 (h) are shown per microliter of blood before infection (Pre) and during peak T cell expansion upon HMBPP/IL-2 cotreatment during chronic infection as averages ± SEM. Groups treated with IL-2 alone or sham are also shown at the same time points. Asterisks indicate groups that were also previously treated during early infection. Also, the CD8+Vγ2− T cells that increased during chronic infection upon HMBPP/IL-2 cotreatment were predominantly of the CD28−CD95+ effector memory phenotype (Fig. 4⇑e). This subset also increased in the group that received IL-2 alone (Fig. 4⇑e). Furthermore, as reported by others, we also found that SHIV89.6P predominantly depletes CXCR4+ naive CD4+ T cells irrespective of treatment (Fig. 4⇑f). Of interest, however, was the fact that during chronic SHIV infection, absolute numbers of CCR5+CD4+ T cells increased in HMBPP/IL-2 cotreated animals (Fig. 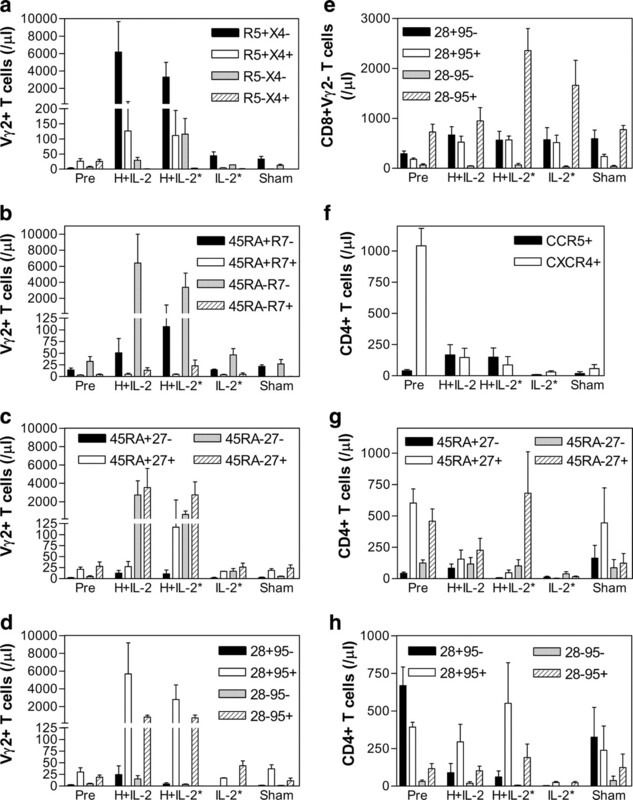 4⇑f) as well as CD4+ T cells that were CD45RA−CD27+ (Fig. 4⇑g) and CD28+CD95+ (Fig. 4⇑h). Conversely, in the three groups treated with IL-2, markedly lower numbers of naive CD45RA+CD27+CD4+ T cells were found when compared with sham-treated animals (Fig. 4⇑g). Thus, HMBPP/IL-2 cotreatment during chronic SHIV infection appears to specifically increase effector memory CD8+ αβ T cells and central and effector memory CD4+ T cells. Next, to investigate whether circulating Vγ2Vδ2 T cells in SHIV-infected macaques retain their ability to recognize HMBPP and exert their antimicrobial effector function, we longitudinally examined the ability of Vγ2 T cells to produce TNF-α and IFN-γ upon ex vivo HMBPP restimulation before and after infection/treatment. We found that HMBPP/IL-2 treatment during chronic SHIV infection resulted in expansion of Vγ2 T cells capable of producing TNF-α (Fig. 5⇓, a and b) and IFN-γ (data not shown) upon ex vivo HMBPP restimulation in only one out of six animals tested. However, in all tested animals that received HMBPP/IL-2 cotreatment during acute and postacute infection, substantial increases in Vγ2 T cells capable of producing TNF-α (Fig. 5⇓b) and IFN-γ (data not shown) were detected upon ex vivo HMBPP restimulation compared with animals treated with only IL-2. HMBPP/IL-2 cotreatment increases phosphoantigen-specific Vγ2 T cells during acute SHIV infection and circulating TNF-α and IFN-γ during chronic infection. Percentages of CD3+ cells that are Vγ2+TNF-α+ after ex vivo HMBPP restimulation are shown over time (a and b). Arrows indicate the time when treatment was given. Plasma IFN-γ and TNF-α concentrations are shown upon treatment during chronic infection (c and d). Data for individual animals treated with HMBPP plus IL-2, IL-2 alone, or sham only during chronic infection (a and c) or during both acute and chronic infection (b and d) are shown. Horizontal lines indicate detection limits (c and d). The increases in IFN-γ (p = 0.015) and TNF-α (p = 0.0024) after HMBPP plus IL-2 treatment are statistically different from pretreatment (c and d). Since effector Vγ2Vδ2 T cells that expanded upon HMBPP/IL-2 cotreatment during chronic lentivirus infection may quickly respond in vivo to various infections or malignancies that arise during these later stages and may become refractory to further stimulation with HMBPP ex vivo, we examined whether the Vγ2Vδ2 T cells that expanded during chronic SHIV infection released their cytokines in vivo. Upon measuring plasma cytokine levels before and after Vγ2Vδ2 T cell activation, we found that in five out of six animals that received HMBPP/IL-2 cotreatment during chronic infection significant increases in IFN-γ and/or TNF-α were detected during peak Vγ2Vδ2 T cell expansion (Fig. 5⇑, c and d; p < 0.05). Additionally, we were able to detect increases in effector Vγ2 T cells producing IFN-γ (Fig. 6⇓a–c, left) and TNF-α (data not shown) after both chronic and acute-stage HMBPP/IL-2 cotreatment without ex vivo Ag restimulation. These data suggest that the Vγ2Vδ2 T cells that massively expand upon HMBPP/IL-2 cotreatment during chronic infection are capable of producing antimicrobial cytokines. HMBPP/IL-2 cotreatment increases antimicrobial cytokine-producing Vγ2 and αβ T cells. Absolute numbers of CD3+IFN-γ+ T cells that are Vγ2+, CD8+, or CD4+ upon ex vivo culture in media alone are shown per microliter of blood over time (a–c). Absolute numbers of CD3+CD8+TNF-α+ T cells after ex vivo restimulation with Gag peptide pool are shown per microliter of blood upon subtracting values obtained from stimulation with media only (d–f). Data are shown as averages ± SEM for groups treated with HMBPP plus IL-2, IL-2 only, or sham. Next, we sought to determine whether HMBPP/IL-2 cotreatment could boost αβ T cell effector responses. We were able to detect transient increases in effector function of CD8+ and CD4+ αβ T cells producing IFN-γ (Fig. 6⇑a–c, middle and right) and TNF-α (data not shown) after both chronic and acute-stage HMBPP/IL-2 cotreatment without ex vivo Ag restimulation. Furthermore, upon ex vivo restimulation with Gag peptides, we were able to detect transient increases in TNF-α-producing effector CD8+ T cells after chronic-stage cotreatment in animals previously naive to treatment (Fig. 6⇑d), but not in those animals that received HMBPP/IL-2 cotreatment during acute-stage infection (Fig. 6⇑, e and f). The difference between chronic and acute treatment settings might be attributed to the enhanced viral pathogenicity that occurred upon HMBPP/IL-2 cotreatment during acute SHIV infection but not during the chronic stage. Thus HMBPP/IL-2 cotreatment during chronic infection may transiently boost virus-specific CD8+ T cells as well as CD4+ and CD8+ αβ T cell effector function. γδ TCR triggering has been shown to result in prominent expression of essential B cell costimulatory molecules, and these cells have been shown to provide potent B cell help during in vitro Ab production (21). To examine whether the massive Vγ2Vδ2 T cell expansions elicited by HMBPP/IL-2 cotreatment altered B cell function in vivo, we analyzed the anti-SHIV IgG Ab dynamics in the plasma of the treated and untreated groups throughout the course of the study. HMBPP/IL-2 cotreatment during chronic infection boosted anti-Env Ab levels from 0.9 ± 0.1 to 1.5 ± 0.1 in five of the six animals tested, whereas all sham-treated animals only showed a slight increase from 0.8 ± 0.0 to 1.0 ± 0.2 during this same period (Fig. 7⇓, a and b; p < 0.05). Similar increases were also seen with Gag-specific Ab levels after chronic-stage cotreatment (data not shown). Importantly, the elevated antiviral Ab levels in HMBPP/IL-2 cotreated animals were sustained throughout the rest of the study (>170 days posttreatment), although the viral antigenic load was not detectably increased. In contrast, only one of the six animals that received IL-2 alone during chronic infection showed an increase in virus-specific Ab levels after treatment (Fig. 7⇓, a and b). In four out of five of the animals that had increased virus-specific Ab levels after cotreatment, these increases were preceded by detectably elevated IL-4 (Fig. 7⇓c) and/or IL-10 (Fig. 7⇓d) levels in the circulation at the time point coinciding with peak Vγ2Vδ2 T cell expansion. On the other hand, five of the six animals that received IL-2 treatment, with or without HMBPP cotreatment, during acute infection barely seroconverted to viral gp120 (Fig. 7⇓b) or gag (data not shown). Therefore, HMBPP/IL-2 cotreatment during chronic SHIV infection significantly boosts virus-specific Ab levels compared with IL-2 only or sham treatment and coincides with increased Th2 cytokine levels in the circulation during peak Vγ2Vδ2 T cell expansion. Virus-specific Abs and Th2 cytokines increase after massive Vγ2Vδ2 T cell expansion during chronic infection. Env-specific IgG levels in 1/50 diluted plasma were analyzed by ELISA and read at OD405 nm are shown over time as averages for each group (a and b) except for HMBPP plus IL-2 treated animals in (b) where individual animals are shown. Arrows and vertical lines indicate the time when treatment was given, while horizontal lines indicate cutoff OD value (<0.23) (a and b). Data shown are averages of three independent ELISA assays. Compared with pretreatment baseline levels, Ab titers increased more after cotreatment than they did after sham treatment (p < 0.05). Also, at days 166–258 postinfection, Ab levels remained significantly higher in the cotreated group compared with sham-treated group (p < 0.05, by Student’s t test). Plasma IL-4 and IL-10 concentrations are shown upon treatment during chronic infection (c and d). Groups treated with HMBPP plus IL-2, IL-2 alone, or sham only during chronic infection (a and c) or during both acute and chronic infection (b and d) are shown. The increases in IL-4 (p = 0.049) and IL-10 (p = 0.0109) at day 3 post-HMBPP plus IL-2 treatment are statistically different from pretreatment (c and d). The immunological benefits induced by the HMBPP/IL-2 cotreatment regimen during chronic infection appear to be at least two-fold: (1) the regimen increases antiviral humoral and cellular immune responses, although such responses do not appear to further control SHIV infection; and (2) it enhances the polyfunctional capability of Vγ2Vδ2 and CD4+ and CD8+ αβ T cells to produce antimicrobial cytokines, which may provide potential therapeutic benefit against AIDS-associated neoplasms or coinfections with HMBPP-producing microbes. The therapeutic potential of massively proliferated Vγ2Vδ2 T cells during AIDS virus infection has not been previously characterized in vivo, even though these cells likely contribute an important mechanism of immunosurveillance against virus-infected cells as well as the bacterial and protozoal infections and neoplasms that contribute to and define AIDS. Moreover, the critical role of such defense mechanisms is highlighted by the recent report of increased gut permeability allowing for bacterial translocation during chronic HIV infection (46). Hence, delineating strategies to enhance the number and function of Vγ2Vδ2 T cells in the context of chronic lentivirus infection appears most timely. To address this mechanism, we utilized the pathogenic SHIV model of AIDS in Chinese rhesus macaques and investigated whether Vγ2Vδ2 T cells could (1) be activated to proliferate and become effector cells during early and chronic phases of infection with HMBPP plus IL-2 cotreatment, (2) affect virus-specific αβ T cell and B cell responses, (3) affect viral replication, and (4) affect survival. We had previously published that SIVmac infection profoundly compromised Vγ2Vδ2 T cell responses after coinfection with HMBPP-producing mycobacteria (32). Here we show that Vγ2Vδ2 T cells can massively proliferate during all phases of SHIV infection upon HMBPP/IL-2 cotreatment. Since others have shown that IL-2 production by CD4+ T cells is impaired during AIDS virus infections (47), the lack of Vγ2Vδ2 T cell responses after bacillus Calmette-Guérin coinfection of SIV+ animals may likely be a bystander effect of inadequate IL-2 production, which we show here could be overcome with exogenous IL-2 treatment. Others have also explored the use of cytokines as immunotherapy in AIDS virus infection. Low-dose daily IL-2 treatment plus ART of early HIV-infected patients increased CD4 T cells and decreased plasma viremia more than just ART alone (48), although the long-term benefit to these patients remains a subject of debate. Macaques infected chronically with SIV showed increases in CD4 T cells and no increase in plasma viremia upon treatment with IL-2 (49), IL-7 (50), and IL-15 (51) in the setting of ART. However, IL-15 treatment alone during acute SIV infection led to increased viremia and exacerbation of disease (52), and an attenuated SIV expressing IL-2 in place of nef induced rapid disease progression in vivo (53). Thus, cytokine therapy alone in the context of lentivirus infection appears to have limited if any therapeutic benefit without concurrent control of viral replication with ART and/or active immunization protocols. In contrast, we show herein that Vγ2Vδ2 T cells can massively proliferate upon stimulation with their Ag, HMBPP, in the presence of IL-2 even in the context of extremely low CD4 T cell levels and high viremia. Our in vivo studies provide the first demonstration that immune intervention predominantly activating T cell populations other than CD4 T cells during acute or chronic-stage infection can lead to different consequences of AIDS virus infection. 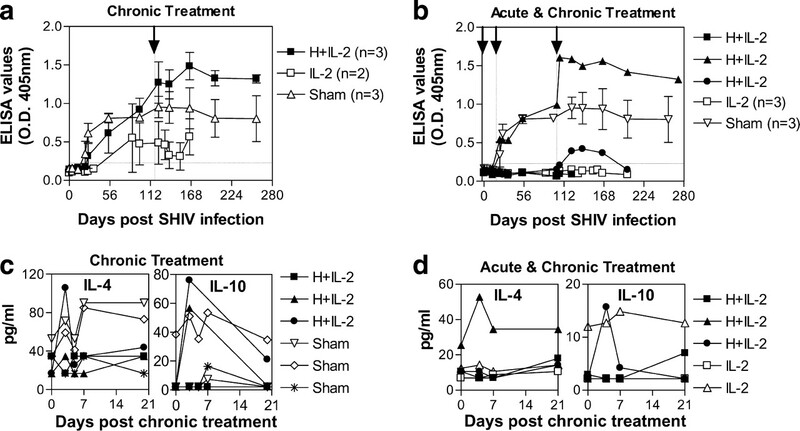 HMBPP/IL-2 treatment during acute SHIV infection increases the viral infection and enhances SIV disease, whereas such treatment given during chronic-stage infection appears to enhance some potentially beneficial immunologic responses without exacerbating SHIV infection/disease. The HMBPP/IL-2-enhanced SHIV infection/disease upon treatment during acute stage may occur due to the following: (1) activation/expansion of CD4 T cells indirectly by activated Vγ2Vδ2 T cells and/or IL-2 leads to more productive SHIV infection; (2) anti-SHIV immune responses that maintain viral set points have not been established and therefore cannot contain the enhanced SHIV infection. It is noteworthy that the presence of large numbers of activated proinflammatory Vγ2Vδ2 T cells during early infection had relatively little effect on viral dynamics and the establishment of antiviral control dictating disease progression. Thus, viremia and virus-specific Ab levels did not differ from animals given IL-2 only nor did survival differ postinfection in animals treated during acute SHIV infection. The next issue to be discussed is whether HMBPP/IL-2 treatment given only during the chronic stage of infection may hold therapeutic potential. The data presented herein clearly suggest that this treatment in the context of viremic SHIV infection was not deleterious based on the findings that (1) viral loads were not increased, (2) CD4+ T cells did not decrease either in the periphery or in the gastrointestinal mucosa, and (3) disease progression did not appear promoted, although this parameter remains to be fully addressed. On the other hand, HMBPP/IL-2 treatment during chronic SHIV infection markedly expanded proinflammatory Vγ2 and αβ T cells displaying memory phenotypes and transiently enhanced effector function of antimicrobial cytokine production by Vγ2Vδ2 T cells as well as CD4+ and CD8+ αβ T cells. Interestingly, despite the absence of HMBPP/IL-2-mediated enhancement of SHIV infection, Vγ2Vδ2 T cell expansion after the cotreatment led to enhanced long-term virus-specific Ab levels in the circulation. Although the direct role of Vγ2Vδ2 T cells in promoting these antiviral immune responses was not shown, at the very least, they are likely a downstream consequence of HMBPP-mediated Vγ2Vδ2 T cell expansion, as control animals treated with IL-2 alone or sham did not have similar increases. Additionally, we addressed the long-held notion that Vγ2Vδ2 T cells are functionally impaired during chronic lentivirus infections by showing that these cells can massively proliferate in vivo upon stimulation with Ag plus IL-2 and that although these cells do not respond to further ex vivo restimulation by secreting Th1 cytokines, elevated levels of these as well as Th2 cytokines can be transiently detected in the circulation during peak expansion of these cells during chronic infection. Thus, Th1 and Th2 cytokines may be released in vivo by activated Vγ2Vδ2 T cells upon HMBPP/IL-2 cotreatment during chronic SHIV infection in response to infections/malignancies that emerge at this late stage of infection and may explain why the duration of Vγ2Vδ2 T cell expansion was considerably shorter during chronic infection compared with early infection or that seen in healthy animals where infections/malignancies that activate these cells are likely not present. Thus, the major strength of this strategy may lie in the control of AIDS-associated opportunistic bacterial/protozoan infections or malignancies, particularly in those individuals with low CD4 T cell counts whereby increased Vγ2Vδ2 T cells may compensate for the CD4 T cell deficiency in fighting such opportunistic infections or malignancies that arise during late stages of HIV infection and could potentially be used to wean patients off the need of continued HAART. Additionally, HMBPP/IL-2 cotreatment may still have immunotherapeutic potential during early infection if viral replication is concomitantly controlled (e.g., with antiretroviral therapy). Furthermore, activated Vγ2Vδ2 T cells may serve as an effective vaccine adjuvant promoting T cell and Ab responses. Our data provide a platform from which future studies aimed at manipulating Vγ2Vδ2 T cells and other mechanisms in the frame of a multipronged immunotherapy and antiretroviral therapy can be devised in efforts to boost the host’s own antiviral defenses. We thank Dr. Lisa Halliday and other University of Illinois at Chicago Biologic Resources Laboratory staff for animal care and technical assistance with inoculations, rectal biopsy sampling, and complete blood counts. We also thank B. Paige, J. Graves, J. Chen and Dr. K. Hagen for technical assistance with flow cytometry. ↵1 This work was supported by National Institutes of Health Grants R01 HL64560 and R01 RR13601 (both to Z.W.C.). ↵3 Abbreviations used in this paper: ART, antiretroviral treatment; HMBPP, (E)-4-hydroxy-3-methyl-but-2-enyl pyrophosphate; SHIV, simian HIV; HAART, highly active antiretroviral treatment. Buchbinder, S. P., D. V. Mehrotra, A. Duerr, D. W. Fitzgerald, R. Mogg, D. Li, P. B. Gilbert, J. R. Lama, M. Marmor, C. Del Rio, et al 2008. Efficacy assessment of a cell-mediated immunity HIV-1 vaccine (the Step Study): a double-blind, randomised, placebo-controlled, test-of-concept trial. Lancet 372: 1881-1893. McElrath, M. J., S. C. De Rosa, Z. Moodie, S. Dubey, L. Kierstead, H. Janes, O. D. Defawe, D. K. Carter, J. Hural, R. Akondy, et al 2008. HIV-1 vaccine-induced immunity in the test-of-concept Step Study: a case-cohort analysis. Lancet 372: 1894-1905. Chen, Z. W., N. L. Letvin. 2003. Vγ2Vδ2+ T cells and anti-microbial immune responses. Microbes Infect. 5: 491-498. Corvaisier, M., A. Moreau-Aubry, E. Diez, J. Bennouna, J. F. Mosnier, E. Scotet, M. Bonneville, F. Jotereau. 2005. Vγ9Vδ2 T cell response to colon carcinoma cells. J. Immunol. 175: 5481-5488. McClanahan, J., P. I. Fukushima, M. Stetler-Stevenson. 1999. Increased peripheral blood γδ T-cells in patients with lymphoid neoplasia: a diagnostic dilemma in flow cytometry. Cytometry 38: 280-285. Hintz, M., A. Reichenberg, B. Altincicek, U. Bahr, R. M. Gschwind, A. K. Kollas, E. Beck, J. Wiesner, M. Eberl, H. Jomaa. 2001. Identification of (E)-4-hydroxy-3-methyl-but-2-enyl pyrophosphate as a major activator for human γδ T cells in Escherichia coli. FEBS Lett. 509: 317-322. Tanaka, Y., C. T. Morita, Y. Tanaka, E. Nieves, M. B. Brenner, B. R. Bloom. 1995. Natural and synthetic non-peptide antigens recognized by human γδ T cells. Nature 375: 155-158. Altincicek, B., J. Moll, N. Campos, G. Foerster, E. Beck, J. F. Hoeffler, C. Grosdemange-Billiard, M. Rodriguez-Concepcion, M. Rohmer, A. Boronat, et al 2001. Cutting edge: human γδ T cells are activated by intermediates of the 2-C-methyl-d-erythritol 4-phosphate pathway of isoprenoid biosynthesis. J. Immunol. 166: 3655-3658. Eberl, M., M. Hintz, A. Reichenberg, A. K. Kollas, J. Wiesner, H. Jomaa. 2003. Microbial isoprenoid biosynthesis and human γδ T cell activation. FEBS Lett. 544: 4-10. Eberl, M., M. Hintz, Z. Jamba, E. Beck, H. Jomaa, G. Christiansen. 2004. Mycoplasma penetrans is capable of activating Vγ9/Vδ2 T cells while other human pathogenic mycoplasmas fail to do so. Infect. Immun. 72: 4881-4883. Zhang, Y., Y. Song, F. Yin, E. Broderick, K. Siegel, A. Goddard, E. Nieves, L. Pasa-Tolic, Y. Tanaka, H. Wang, et al 2006. Structural studies of Vγ2Vδ2 T cell phosphoantigens. Chem. Biol. 13: 985-992. Gober, H. J., M. Kistowska, L. Angman, P. Jeno, L. Mori, G. De Libero. 2003. Human T cell receptor γδ cells recognize endogenous mevalonate metabolites in tumor cells. J. Exp. Med. 197: 163-168. Bonneville, M., J. J. Fournie. 2005. Sensing cell stress and transformation through Vγ9Vδ2 T cell-mediated recognition of the isoprenoid pathway metabolites. Microbes Infect. 7: 503-509. Poccia, F., B. Cipriani, S. Vendetti, V. Colizzi, Y. Poquet, L. Battistini, M. Lopez-Botet, J. J. Fournie, M. L. Gougeon. 1997. CD94/NKG2 inhibitory receptor complex modulates both anti-viral and anti-tumoral responses of polyclonal phosphoantigen-reactive Vγ9Vδ2 T lymphocytes. J. Immunol. 159: 6009-6017. Gan, Y. H., M. Malkovsky. 1996. Mechanisms of simian γδ T cell cytotoxicity against tumor and immunodeficiency virus-infected cells. Immunol. Lett. 49: 191-196. Poccia, F., L. Battistini, B. Cipriani, G. Mancino, F. Martini, M. L. Gougeon, V. Colizzi. 1999. Phosphoantigen-reactive Vγ9Vδ2 T lymphocytes suppress in vitro human immunodeficiency virus type 1 replication by cell-released antiviral factors including CC chemokines. J. Infect. Dis. 180: 858-861. Poccia, F., C. Agrati, F. Martini, M. R. Capobianchi, M. Wallace, M. Malkovsky. 2005. Antiviral reactivities of γδ T cells. Microbes Infect. 7: 518-528. Devilder, M. C., S. Maillet, I. Bouyge-Moreau, E. Donnadieu, M. Bonneville, E. Scotet. 2006. Potentiation of antigen-stimulated Vγ9Vδ2 T cell cytokine production by immature dendritic cells (DC) and reciprocal effect on DC maturation. J. Immunol. 176: 1386-1393. Brandes, M., K. Willimann, G. Bioley, N. Levy, M. Eberl, M. Luo, R. Tampe, F. Levy, P. Romero, B. Moser. 2009. Cross-presenting human γδ T cells induce robust CD8+ αβ T cell responses. Proc. Natl. Acad. Sci. USA 106: 2307-2312. Brandes, M., K. Willimann, A. B. Lang, K. H. Nam, C. Jin, M. B. Brenner, C. T. Morita, B. Moser. 2003. Flexible migration program regulates γδ T-cell involvement in humoral immunity. Blood 102: 3693-3701. Caccamo, N., L. Battistini, M. Bonneville, F. Poccia, J. J. Fournie, S. Meraviglia, G. Borsellino, R. A. Kroczek, C. La Mendola, E. Scotet, et al 2006. CXCR5 identifies a subset of Vγ9Vδ2 T cells which secrete IL-4 and IL-10 and help B cells for antibody production. J. Immunol. 177: 5290-5295. Shen, Y., D. Zhou, L. Qiu, X. Lai, M. Simon, L. Shen, Z. Kou, Q. Wang, L. Jiang, J. Estep, et al 2002. Adaptive immune response of Vγ2Vδ2+ T cells during mycobacterial infections. Science 295: 2255-2258. Wang, L., A. Kamath, H. Das, L. Li, J. F. Bukowski. 2001. Antibacterial effect of human Vγ2Vδ2 T cells in vivo. J. Clin. Invest. 108: 1349-1357. Dieli, F., M. Troye-Blomberg, J. Ivanyi, J. J. Fournie, M. Bonneville, M. A. Peyrat, G. Sireci, A. Salerno. 2000. Vγ9/Vδ2 T lymphocytes reduce the viability of intracellular Mycobacterium tuberculosis. Eur. J. Immunol. 30: 1512-1519. Farouk, S. E., L. Mincheva-Nilsson, A. M. Krensky, F. Dieli, M. Troye-Blomberg. 2004. γδ T cells inhibit in vitro growth of the asexual blood stages of Plasmodium falciparum by a granule exocytosis-dependent cytotoxic pathway that requires granulysin. Eur. J. Immunol. 34: 2248-2256. Troye-Blomberg, M., S. Worku, P. Tangteerawatana, R. Jamshaid, K. Soderstrom, G. Elghazali, L. Moretta, M. Hammarstrom, L. Mincheva-Nilsson. 1999. Human γδ T cells that inhibit the in vitro growth of the asexual blood stages of the Plasmodium falciparum parasite express cytolytic and proinflammatory molecules. Scand. J. Immunol. 50: 642-650. Enders, P. J., C. Yin, F. Martini, P. S. Evans, N. Propp, F. Poccia, C. D. Pauza. 2003. HIV-mediated γδ T cell depletion is specific for Vγ2+ cells expressing the Jγ1.2 segment. AIDS Res. Hum. Retroviruses 19: 21-29. Li, H., H. Peng, P. Ma, Y. Ruan, B. Su, X. Ding, C. Xu, C. D. Pauza, Y. Shao. 2008. Association between Vγ2Vδ2 T cells and disease progression after infection with closely related strains of HIV in China. Clin. Infect. Dis. 46: 1466-1472. Poccia, F., S. Boullier, H. Lecoeur, M. Cochet, Y. Poquet, V. Colizzi, J. J. Fournie, M. L. Gougeon. 1996. Peripheral Vγ9/Vδ2 T cell deletion and anergy to nonpeptidic mycobacterial antigens in asymptomatic HIV-1-infected persons. J. Immunol. 157: 449-461. Kosub, D. A., G. Lehrman, J. M. Milush, D. Zhou, E. Chacko, A. Leone, S. Gordon, G. Silvestri, J. G. Else, P. Keiser, et al 2008. γ/δ T-cell functional responses differ after pathogenic human immunodeficiency virus and nonpathogenic simian immunodeficiency virus infections. J. Virol. 82: 1155-1165. Zhou, D., X. Lai, Y. Shen, P. Sehgal, L. Shen, M. Simon, L. Qiu, D. Huang, G. Z. Du, Q. Wang, et al 2003. Inhibition of adaptive Vγ2Vδ2+ T-cell responses during active mycobacterial coinfection of simian immunodeficiency virus SIVmac-infected monkeys. J. Virol. 77: 2998-3006. Martini, F., F. Poccia, D. Goletti, S. Carrara, D. Vincenti, G. D'Offizi, C. Agrati, G. Ippolito, V. Colizzi, L. P. Pucillo, C. Montesano. 2002. Acute human immunodeficiency virus replication causes a rapid and persistent impairment of Vγ9Vδ2 T cells in chronically infected patients undergoing structured treatment interruption. J. Infect. Dis. 186: 847-850. Hebbeler, A. M., N. Propp, C. Cairo, H. Li, J. S. Cummings, L. P. Jacobson, J. B. Margolick, C. D. Pauza. 2008. Failure to restore the Vγ2-Jγ1.2 repertoire in HIV-infected men receiving highly active antiretroviral therapy (HAART). Clin. Immunol. 128: 349-357. Shen, L., Y. Shen, D. Huang, L. Qiu, P. Sehgal, G. Z. Du, M. D. Miller, N. L. Letvin, Z. W. Chen. 2004. Development of Vγ2Vδ2+ T cell responses during active mycobacterial coinfection of simian immunodeficiency virus-infected macaques requires control of viral infection and immune competence of CD4+ T cells. J. Infect. Dis. 190: 1438-1447. Bordon, J., P. S. Evans, N. Propp, C. E. Davis, Jr, R. R. Redfield, C. D. Pauza. 2004. Association between longer duration of HIV-suppressive therapy and partial recovery of the Vγ2 T cell receptor repertoire. J. Infect. Dis. 189: 1482-1486. Ali, Z., L. Shao, L. Halliday, A. Reichenberg, M. Hintz, H. Jomaa, Z. W. Chen. 2007. Prolonged (E)-4-hydroxy-3-methyl-but-2-enyl pyrophosphate-driven antimicrobial and cytotoxic responses of pulmonary and systemic Vγ2Vδ2 T cells in macaques. J. Immunol. 179: 8287-8296. Huang, D., C. Y. Chen, Z. Ali, L. Shao, L. Shen, H. A. Lockman, R. E. Barnewall, C. Sabourin, J. Eestep, A. Reichenberg, et al 2009. Antigen-specific Vγ2Vδ2 T effector cells confer homeostatic protection against pneumonic plaque lesions. Proc. Natl. Acad. Sci. USA 106: 7553-7558. Reimann, K. A., J. T. Li, R. Veazey, M. Halloran, I. W. Park, G. B. Karlsson, J. Sodroski, N. L. Letvin. 1996. A chimeric simian/human immunodeficiency virus expressing a primary patient human immunodeficiency virus type 1 isolate env causes an AIDS-like disease after in vivo passage in rhesus monkeys. J. Virol. 70: 6922-6928. Veazey, R. S., M. De Maria, L. V. Chalifoux, D. E. Shvetz, D. R. Pauley, H. L. Knight, M. Rosenzweig, R. P. Johnson, R. C. Desrosiers, A. A. Lackner. 1998. Gastrointestinal tract as a major site of CD4+ T cell depeletion and viral replication in SIV infection. Science 280: 427-431. Amara, R. R., F. Villinger, J. D. Altman, S. L. Lydy, S. P. O'Neil, S. I. Staprans, D. C. Montefiori, Y. Xu, J. G. Herndon, L. S. Wyatt, et al 2001. Control of a mucosal challenge and prevention of AIDS by a multiprotein DNA/MVA vaccine. Science 292: 69-74. Cline, A. N., J. W. Bess, M. Piatak, Jr, J. D. Lifson. 2005. Highly sensitive SIV plasma viral load assay: practical considerations, realistic performance expectations, and application to reverse engineering of vaccines for AIDS. J. Med. Primatol. 34: 303-312. Matsushita, S., M. Robert-Guroff, J. Rusche, A. Koito, T. Hattori, H. Hoshino, K. Javaherian, K. Takatsuki, S. Putney. 1988. Characterization of a human immunodeficiency virus neutralizing monoclonal antibody and mapping of the neutralizing epitope. J. Virol. 62: 2107-2114. Putney, S. D., T. J. Matthews, W. G. Robey, D. L. Lynn, M. Robert-Guroff, W. T. Mueller, A. J. Langlois, J. Ghrayeb, S. R. Petteway, Jr, K. J. Weinhold, et al 1986. HTLV-III/LAV-neutralizing antibodies to an E. coli-produced fragment of the virus envelope. Science 234: 1392-1395. Rusche, J. R., D. L. Lynn, M. Robert-Guroff, A. J. Langlois, H. K. Lyerly, H. Carson, K. Krohn, A. Ranki, R. C. Gallo, D. P. Bolognesi, et al 1987. Humoral immune response to the entire human immunodeficiency virus envelope glycoprotein made in insect cells. Proc. Natl. Acad. Sci. USA 84: 6924-6928. Brenchley, J. M., D. A. Price, T. W. Schacker, T. E. Asher, G. Silvestri, S. Rao, Z. Kazzaz, E. Bornstein, O. Lambotte, D. Altmann, et al 2006. Microbial translocation is a cause of systemic immune activation in chronic HIV infection. Nat. Med. 12: 1365-1371. Sun, Y., J. E. Schmitz, P. M. Acierno, S. Santra, R. A. Subbramanian, D. H. Barouch, D. A. Gorgone, M. A. Lifton, K. R. Beaudry, K. Manson, et al 2005. Dysfunction of simian immunodeficiency virus/simian human immunodeficiency virus-induced IL-2 expression by central memory CD4+ T lymphocytes. J. Immunol. 174: 4753-4760. Davey, R. T., Jr, D. G. Chaitt, J. M. Albert, S. C. Piscitelli, J. A. Kovacs, R. E. Walker, J. Falloon, M. A. Polis, J. A. Metcalf, H. Masur, et al 1999. A randomized trial of high- versus low-dose subcutaneous interleukin-2 outpatient therapy for early human immunodeficiency virus type 1 infection. J. Infect. Dis. 179: 849-858. Craiu, A., D. H. Barouch, X. X. Zheng, M. J. Kuroda, J. E. Schmitz, M. A. Lifton, T. D. Steenbeke, C. E. Nickerson, K. Beaudry, J. D. Frost, et al 2001. An IL-2/Ig fusion protein influences CD4+ T lymphocytes in naive and simian immunodeficiency virus-infected Rhesus monkeys. AIDS Res. Hum. Retroviruses 17: 873-886. Beq, S., M. T. Nugeyre, R. Ho Tsong Fang, D. Gautier, R. Legrand, N. Schmitt, J. Estaquier, F. Barre-Sinoussi, B. Hurtrel, R. Cheynier, N. Israel. 2006. IL-7 induces immunological improvement in SIV-infected rhesus macaques under antiviral therapy. J. Immunol. 176: 914-922. Picker, L. J., E. F. Reed-Inderbitzin, S. I. Hagen, J. B. Edgar, S. G. Hansen, A. Legasse, S. Planer, M. Piatak, Jr, J. D. Lifson, V. C. Maino, et al 2006. IL-15 induces CD4 effector memory T cell production and tissue emigration in nonhuman primates. J. Clin. Invest. 116: 1514-1524. Sawai, E. T., M. S. Hamza, M. Ye, K. E. Shaw, P. A. Luciw. 2000. Pathogenic conversion of live attenuated simian immunodeficiency virus vaccines is associated with expression of truncated Nef. J. Virol. 74: 2038-2045.